In recent years, Netflix has been obsessed with teenage cliche dramas, like the very-popular 13 Reasons and To All The Boys I Loved Before. That “teenage” market can be a bit well, oversaturated. And if it’s not corny teenage drama, Netflix’s obsession with cocaine and drug cartels has become quite the bore, too. But watch out, boring binges. Mr. Pogo and seven children of The Umbrella Academy, based on a comic series by Gerard Way, are here if you’re looking for freshness to keep you up watching all night. From superpowers alternating from character to character to engaging plot twists, The Umbrella Academy has been well received by audiences around the world. The question is, is this something you would binge? Let’s find out. The pilot episode begins by introducing how the kids of the Umbrella Academy were brought together. Shortly after the backstory, audiences are given an updated look on the characters, who are reunited after the death of their father, in their adult state. Who’s where, who’s there, and weirdly, who isn’t there. Unlike some TV shows where the information is often fed at something comparable to a snail’s pace, the Umbrella Academy shines here, getting to the point and keeping unnecessary dialogue and background info to a minimum. By doing this, we dive into action without sacrificing time. This is especially great for watchers who are impatient. Admittedly, at first watch, and also through the first few episodes, the writing comes off a little forced. Though, throughout the rest of season one, the chemistry vastly improves between the actors, and is translated well on-screen as the characters seem more comfortable with each other, as if they are an actual family they are claimed to be. It ends up being quite entertaining and intriguing to watch each conversation boil down. The writers do a great job at keeping audiences guessing what will happen next. The humor is rarely forced and sometimes while the plot does not make you laugh necessarily, it still remains pleasurable. There also seems to be inside jokes between characters, which gives them a more human feel even with their supernatural powers. This helps them feel somewhat relatable which keeps people watching. That is how bonds are created with some viewers to the characters. While this happens, there still seems to be a mysterious element with the characters. The contrast between what Number 5 says and the decision he ends up making are sure to keep audiences on the edge of their seats. From veterans to newbies, the key actors in this series are nothing short of spectacular. Each conversation is filled with life and feels “human” and natural. Each actor, combined with the writing represents the role you would expect them to, perfectly off of appearance alone. Ellen Page, known from the 2010 blockbuster Inception, who plays Vanya Hargreeves, seems to be so confident and refined, that it causes an almost rebound experience with the other actors. The only exception to actors playing well off each other is Pogo. This is due to 1.) His lack of screentime and 2.) He is the only major CGI (computer generated imagery) character in season one. “Mom,” who is no “mom” at all, is also a pitfall at times, particulary when she seems to slow down the show. However, the dynamic duo of Cha-Cha, played by singer Mary J. Blige, and Hazel who make up for where other minor characters lack. All in all, the show has proven so far to be a great show to watch. The directors have seemed to have nailed an on-screen adaptation of the books. It remains creative, especially through the cinematography. 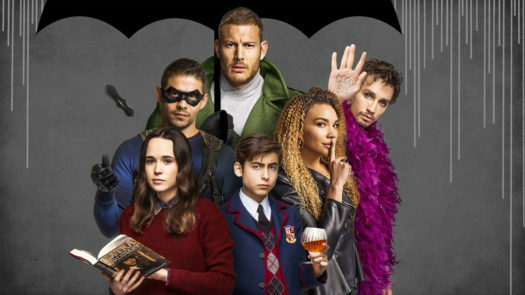 The Umbrella Academy is creative, funny, quirky, and definitely binge worthy. Now get to watching!